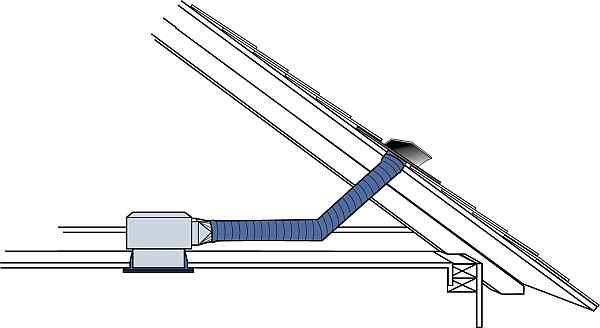 Air sealing is indeed one of the best ways to reduce the energy consumption and comfort of your home. But a tighter home may also require you to provide better mechanical ventilation such as kitchen and bath fans. Follow these guidelines to be sure your ventilation system is doing its job. Install exhaust fans in your kitchen and bathrooms to collect and remove pollutants where they’re being generated. Make absolutely sure that your exhaust fans vent to the outdoors through the roof or wall. The termination fitting or the fan itself should have a backdraft damper to prevent air from blowing in and out when the fan is off. Buy the quietest fans available so your family will tend to use them. The noise level of fans is measured in sones. Most fans are rated at more than 2 sones but the better models emit only 0.5 to 1.5 sones of noise. Rather than expecting your fans to remove all your moisture and odors, do your best to control moisture and odors at their sources. Don’t idle your car in the garage or near the home. Fix drainage problems around your roof and foundation. And install a plastic ground moisture barrier on the floor of crawl spaces to keep your home dry and healthy. Recirculating kitchen range fans. which don’t vent to the outdoors, merely circulate the polluted air through charcoal filters. These filters remove some odors, but most of the pollutants remain right in your kitchen. Residential Energy, The Homeowners Handbook to Energy Efficiency, and Your Mobile Home all have extensive information on solving moisture problems and improving indoor air quality.